The Red Eyed Tree Frogs range is from central Mexico to Guatemala. 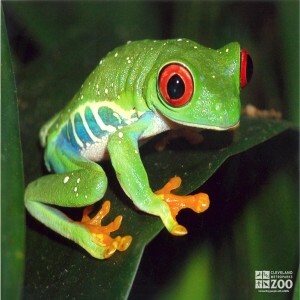 Red-Eyed Tree Frogs live in humid forests. The red-eyed tree frog is common during the rainy season around pools and water-filled ditches, within or adjacent to forests. During the dry season they retreat to epiphytic bromeliads and other arboreal shelters. They are nocturnal, and search for insects among the leaves and branches of the forest trees. The call of the male is usually a single note "cluck" or "chock", repeated at spaced intervals. They have a slow, stalking movement as they creep up on their prey. The Red Eyed Tree Frog breeds in bushes and palms beginning with the first rains of the wet season (late May to November). During amplexus within the plants, the female attaches a clump averaging 40 sticky jelly-covered eggs to a leaf directly above the water. As the 1-centimeter tadpoles hatch out after 6-10 days, they fall into the water.